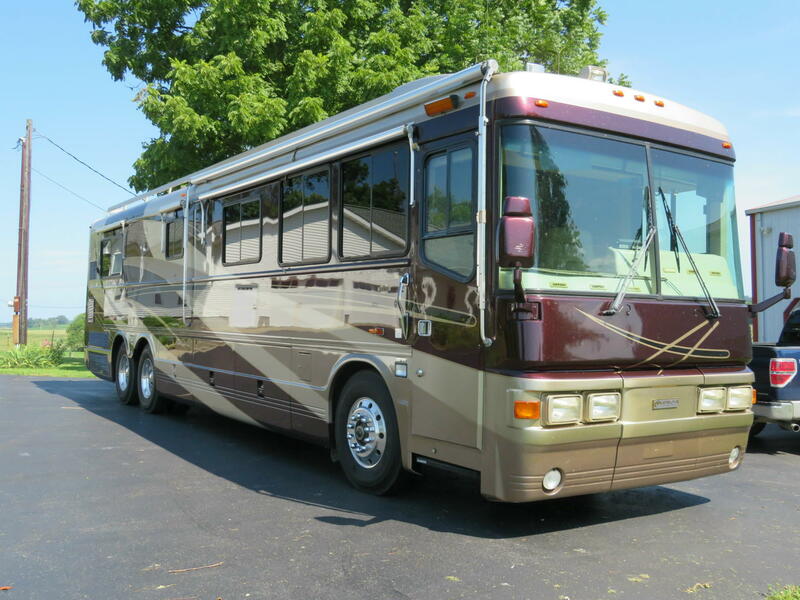 #835 KY This 2000 LX Millennium Edition coach looks great inside and out with only 69,921 miles. The coach is road ready with 3 yr old Michelin XZA tires, two year old AGM house batteries, and two year old engine batteries. Tag axle air bags have been replaced. Keyless entry. Direct TV ready Winegard satellite system and blue ray DVD player. The Frigidaire household refrigerator with ice-maker is a great feature. The coach is equipped with 450HP turbo Cummins ISM with two stage Jacob engine brake and Allison 6-speed transmission. Bendix anti-lock air brakes. 12.5 KW Powertech generator with auto start has 2998 hours. EXTERIOR colors are maroon, tan, beige, and gold pinstriping with double clear coat. INTERIOR are colors brown, tan, beige with custom European gloss beige laminate cabinetry. Solid surface entrance steps with polished brass grab rails. Center aisle floor plan with down spotter lighting throughout. Six way power pilot and co-pilot seats covered in beige ultra-leather. Cobra CB radio and built in radar detector. LIVING ROOM has custom wood plank flooring, LG 26" flat screen TV, Kenwood stereo/CD with ten disc changer, two beige leather covered fold down sofas, coordinated window treatments, and day-night shades throughout. KITCHEN has tan laminated cabinets with Corian counter top, double bowl molded sinks, household refrigerator, Grohe faucet, beveled mirror strips backsplash, two burner LP cook top, Sharp carousel micro-convection oven, double pantry, and diagonal laid tile flooring in kitchen and walk through bath. Dinette extension table with high back beige leather chairs has extension leaf and two folding chairs. WALK THROUGH BATH features private toilet with window, cultured marble vanity, large round shower, and mirrored door wardrobe. BEDROOM has queen island bed with overhead cabinet, Corian topped night stands, 26" LG flat screen TV with below storage, double mirrored door wardrobe, security control switch, and carpeting. OTHER FEATURES include: 2800 watt Magnum inverter, full Zip Dee awning package, Blue Bird lawn chairs, HWH computerized leveling jacks, 50,000 btu Aqua Hot hydronic heating, three ducted AC units with heat strips, two thermostat controlled electric heaters, rear view monitor, burglar alarm, door chime, and dual heated remote controlled review mirrors. This no pet, non-smoker coach is in very good condition inside and out. Always garaged when not in use. Blue box with manuals and maintenance records. Owner asking $92K. Call 217-826-8907 for details.